When the simulation begins, the two blocks have the same parameters, so they move together. Just focus on the connection between the uniform circular motion (the motion of the ball in a circular path at constant speed) and the simple harmonic motion. Describe the relationship between these two motions. Now, give the two blocks different amplitudes, while keeping everything else the same. How do the motions of the two blocks on springs compare? 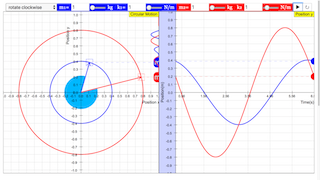 Can you make sense of this by comparing the harmonic motion to the corresponding circular motion? Set the amplitudes to the same values, but now change either the mass or the spring constant of one of the blocks so that the blocks have different angular frequencies. How do the motions of the two blocks on springs compare? Can you make sense of this by comparing the harmonic motions to the corresponding circular motions? Set the amplitudes, masses, and spring constants of the two blocks so that they match, and now just change the phase of one block with respect to the other. How do the motions of the two blocks on springs compare? Can you make sense of this by comparing the harmonic motions to the corresponding circular motions? What does it mean for two objects to be 180 degrees out of phase? In this simulation, you can use the combo box on the top left corner to make the circular motion rotate either clockwise or anti-clockwise. The sliders at the top can be adjusted to change the mass (kg) and the spring constant (N/m) of the mass corresponding to the colour.